Low jars are popular for citronella candles. If you're planning a summer party or just enjoy evenings outdoors, glass citronella candles can be a beautiful and useful addition to your outdoor décor. With a variety of design options available, these popular candles are easy to find and can match whatever style you are interested in. Citronella oil is derived from a variety of tropical grasses in the Cymbopogon family. The oil is produced primarily in Asia and South America, but it is easy to make and readily available in a wide variety of candle designs as well as soap, perfumes, and other products throughout the world. Citronella oil is one of the most effective and well known organic insect repellents available. While it will not repel all insects, using citronella oil and citronella candles can dramatically reduce the number of insects in an area, making it more comfortable for you to enjoy outdoor evenings in your yard without being bothered by insects. If you do not like the glass holders for citronella candles that are available, terra cotta pots, tin pails, and torch tapers are other options that add rustic or exotic touches to your outdoor decorations. Furthermore, it is easy to find citronella tea lights and votives that you can add to your own glass candle holders: dragonflies, butterflies, leaves, flowers, and other nature themed holders are particularly popular for citronella candles. Citronella candles are readily available at major retailers who carry outdoor equipment, such as home improvement and hardware stores, camping stores, landscaping nurseries, and general retailers such as Target, Walmart, and Kmart. Their selections can be limited, however, and they may only carry citronella candles during spring and summer when outdoor activities are more popular. Add citronella votives to decorative holders. If you can't find just the right types of citronella candles, you can purchase citronella essential oil to add to homemade candles instead. Jar candles are particularly easy to make, and you can create a complete set of coordinated candles in whatever theme you like. Using citronella candles is as easy as lighting one or two and placing them on a patio table, bench, or deck railing. Their insect repellent effectiveness is limited to a small area, however, and if you place multiple candles around the perimeter of the space you will avoid many more insects. Position larger citronella candles near deck or patio corners and add tea lights, votives, or torches in between them for a richer ambience with even fewer insects. If you are trying to keep a large area insect-free, have a few citronella candles on the interior as well, such as adding them to a candle centerpiece or hanging them from a patio umbrella. Before you light too many citronella candles, however, be aware that their lemon-like, citrus scent may be refreshing in small doses but can quickly become overpowering. If you plan on using a lot of candles, keep them properly spaced to avoid too much aroma. Whether you are using candles inside or outside, they should always be properly attended so there is on risk of fire or burns. Keep lit candles away from pets and young children. Do not place citronella candles near leaves, branches, or other potentially flammable materials. Use a candle holder that keeps the flame shielded from sudden breezes. 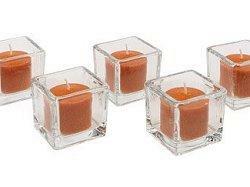 Place candles on sturdy surfaces that are out of the way of being tipped or bumped to avoid spills. 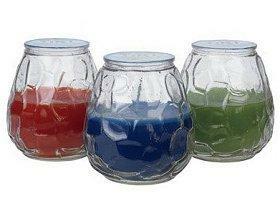 Glass citronella candles can be a lovely and useful addition to any porch, patio, or yard. By choosing the right types of candles in appropriate sizes, you can enjoy the beauty of outdoor candles without the bother of evening insects.